A smart, professional-looking business card speaks volumes about you; it’s often your first point of entry with promoters, club owners or anyone else, including fans, who can get you gigs. It’s better than just trading phone numbers. A well-designed card makes an impression that people will remember when you call them to follow up. Having a logo isn’t enough to establish your brand. Despite the huge popularity of social networking platforms like Facebook and Twitter, business cards are still one of the best ways to get your name and contact information in front of the people you need to impress. A business card is a tangible reminder of you, and an easy point of reference for anyone who’s interested in contacting you. Any random sample of 100 business cards will probably turn up just two or three that have a memorable and compelling design. We can’t offer a foolproof method for creating a card that will guarantee you’re among those rare few, but we have some ideas that can get you started. Get a feel for what’s out there. If you keep stacks of business cards from the people you’ve met over the years, flip through them and take note of which ones stand out. What drew your eye to it, and why does it make other cards look knocked-off or unprofessional? You can find plenty of other examples online; take an hour to browse the web to find cards that might work for you, and think about the elements—logo, font, design, elegance and simplicity—that make the card stand out. The best designs are clean and easy to read. An artsy background surface can make your business card memorable, but it shouldn’t interfere with its legibility. Your business card is meant to give people your name and contact information so they can get in touch with you, and that’s it. You don’t need to muddy it up with excessive design or decoration, so use a font that’s easy to read. Use your logo if you have one, and feel free to write “Ask Me to DJ” next to your phone number and e-mail contact. If you give people a call to action, they’re more likely to respond. Don’t sacrifice quality. Imagine you’re walking through Miami Beach and run into the owner of the biggest club in the city. Would you give him a card that cost two cents to print? For elite business cards, choose a heavy, 100-to-120-pound paper stock and bright, high-quality ink. A rough or silk surface feels great to the touch. The best cards can cost as much as two dollars each— pretty expensive, but a huge gig will pay for a thousand cards. It’s a worthy investment in your career. There are two sides to every story. Never leave the back of your card blank. If you leave this space open, people will use it as scrap paper, and might leave the club with a phone number written on the back that isn’t yours. One option is to print a dark background on the back, or you can go with a large version of your logo, or something else altogether (in Japan, for instance, most businesses print Japanese on one side and English on the other). Fans will keep your card longer if they admire what you’ve created. If you don’t feel comfortable creating a design for a logo or a card, work with a graphic designer to make sure you get the look you want. You’re creating something that can ultimately define your career, so have fun with it. Try this website. We love Moo.com and their templates for business cards. They have designs you can customize and print without having to learn Adobe Photoshop. Their templates will help you create a cool design in a few minutes; you can customize your name and contact information, and choose from a number of great designs to match your personality. If you don’t have access to a graphic designer, we think this is the best way to create business cards yourself. 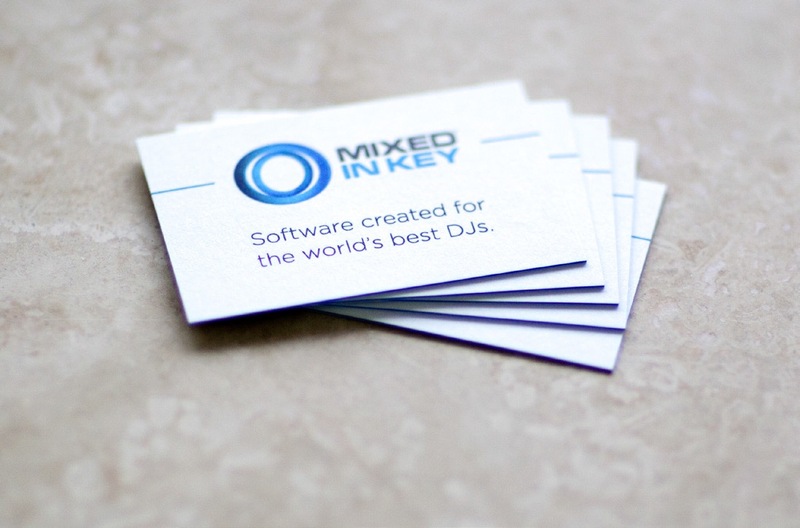 In our case, our Mixed In Key cards took about a week to design and ship, and the results were stunning.